Its such a little word and such an easy word to say…but such a difficult word to accept. Some people won't take no for an answer…some kids cry when their parents tell them no. Some people get very dejected when the answer is no. Its amazing how such a little word can pack such an incredible punch! My kids hear the word no from my wife and I all the time. Usually the word is uttered when they want something from one of us. It could be because they want something frivolous from the mall, money, some kind of sweet treat (even if they haven't eaten their fruit or vegetables)..the list of requests is endless. When we tell them that the answer to their request is no…they usually re-phrase the question but get the same answer, except the second time around we usually say, “how many times do I need to say, no! ?” Or, do we use that after the third time? Maybe the fourth? 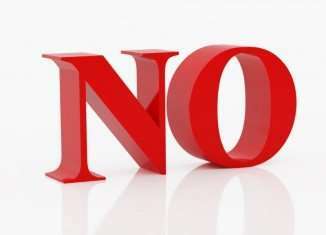 Sometimes, to ease the pain of hearing the word no, we will qualify our no with a reason for the answer no. “Annie, the answer is no. You had a sweet snack earlier today and one special treat is more than enough….so the answer is no!” Usually, there is a big sigh, a groan of frustration and finally…acceptance of our decision. For our older daughter, hearing the word no takes more effort on our part to reinforce. We usually have to go through a few rounds of heated exchange before she finally gives up; and that is exactly what it is with our 13 year old…a battle of wills to see who will eventually throw the towel in and give up. Molly is very smart, though. She will push it hard with us for a little while, then retreat…only to come back for another round later to see if time has softened our position. More times than not, we stand firm and she eventually backs down leading to a funky mood that can last for hours. However, saying no sometimes involves saying yes. It means learning to pick your battles. Recently, both our daughters approached my wife asking her if we could take them to the mall to have additional ear-pierces. Molly would have a second set and Annie just wanted one. When I first heard about their request from my wife, too pleased I was not! After all, what was the purpose of it? It would look so ugly. Why spend the money? I told my wife how I felt and that we should definitely say no to their request. However, my thinking soon changed when my wife said, “let this be the strangest request they make of us”. She went on to say, “changing their hair color or getting an ear pierced is no big deal…it certainly beats the alternative”. So, our no became a yes. Was it really a big deal to allow them this? Our kids are very well-behaved, loving, grounded and bring us an incredible amount of joy. So what if they wanted this? Was it really such a huge request? So, we went ahead and took them to the mall first thing on a Saturday morning and they got what they wanted. Neither of them cried when they had the actual pierce, unlike the first time when we went almost went through a box of tissue…wiping away tears of fear followed by tears of joy that it was finally over. “You gotta know when to hold them and know when to fold them”. Being a parent is about making choices and decisions always in the best interest of our children. Its about setting parameters and guidelines. But at a certain point, its also about being pliable and allowing some give and take in making decisions. The good news is…they are done pestering us for more ear piercings…for now! But I do draw the line at belly-button rings!